Voices is a co-production by Witte de With, Center for Contemporary Art in Rotterdam, the Fundacio Joan Miro in Barcelona, and Le Fresnoy - Studio National des Arts Contemporains in Tourcoing, France. For centuries the human voice existed outside the proper field of the visual arts, inhabiting a region of experience that lay beyond purely pictorial rendition. In recent decades, however, as artists have come to explore the rich continuum of sounds and sights that now make up the audiovisual environment, the complex relation between voice and visual image has received increasing attention. Against this background, the exhibition Voices sets out to probe the uses of the voice as metaphor and material in contemporary art. Curated by New York-based critic Christopher Phillips, Voices presents works by Vito Acconci (New York, 1940), Genevieve Cadieux (Montreal, 1955), Jochen Gerz (Berlin, 1940), Gary Hill (Santa Monica, 1951), Pierre Huyghe (Paris, 1962) and Kristin Oppenheim (Honolulu, 1959); new works were created for the exhibition by Judith Barry (Columbus, Ohio, 1954), Janet Cardiff (Brussels, Ontario, 1957) & George Bures Miller (Vegreville, Alberta, 1960) and Moniek Toebosch (Breda, 1948). Employing a wide range of media - including video, film, photography, and multimedia installation -these pieces pose provocative questions concerning the role of the voice as an instrument of communication and expression in twentieth-century culture. The works in the exhibition touch upon a variety of themes. These include the "interior voice" as an emblem of the self; the "voice of power" that speaks to us through the mass media; the heritage of Dada phonetic poetry and post-World War II poésie sonore; the paradoxical pairing of voice and image in cinema; and the experimental combination of vocal and electronically generated sounds. More generally, Voices encourages us to think in a new way about the subtle transformation of social relations that have been produced by such inventions as the telephone, radio, loudspeaker, tape recorder and computerized voice synthesizer. Voices is accompanied by a fully illustrated catalogue which includes texts by curator Christopher Phillips, on the voice as metaphor and material in recent art; art critic Kate Linker, on the use of the voice in video art, taking the work of Vito Acconci as an example; and the article "The voice between body and language" by French psychoanalyst Guy Rosolato, as well as a section of artists' pages documenting the works in the exhibition, and a bibliography and discography. Voices was previously on view at the Witte de With, Center for Contemporary Art, in Rotterdam from I 3th June to 23rd August. After its showing at the Fundacio Joan Miro in Barcelona, the exhibition will travel to Tourcoing, where it can be seen at Le Fresnoy - Studio National des Arts Contemporains until 4th April 1999. The 21st November 1998 is the centenary of the birth of the painter Rene' Magritte (1898, Hainaut, Belgium), one of the most representative members of the Surrealist movement in Europe. The Joan Miro Foundation will be marking the event with the exhibition Magritte, selected by the art critic Maria Lluisa Borras and sponsored exclusively by the Banco Bilbao Vizcaya. Narrative and mystery. Narrative is the origin of many of the paintings in which the recourse to cinematographic suspense is clearly evident, particularly considering Magritte's fascination with films. This was the case of pieces such as La lectrice soumise or L'Histoire centrale, both from 1928. Chance encounters. 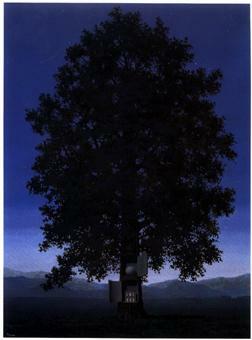 Magritte contrasts and combines images, settings, figures or objects to produce paradoxical effects that invite reflection, such as the painting Le Grand Siecle, 1954. Metamorphosis. The artist produces striking transformations, as a metaphor for the unforgiving effects of time, in order to show that nothing can ever be as it was before. Examples of this metamorphosis can be found in La fôret, 1927 and In memoriam Mack Sennet, 1936. Mechanisms of language. Magritte shows explicitly the absence of any real relationship between the object and its representation, be it image or words, and at the same time demonstrates the different levels of reality, as in La table, l'ocean, le fruit, 1927 and La femme cachee, 1929. The picture within the picture, as a process for fixing reality on a piece of canvas, as in La clef des champs, 1936. The aim of the exhibition, which includes paintings from the most important public and private collections in Europe, is to bring the general public closer to the work of Rene' Magritte, which has never before been shown in an exhibition of its own in Spain. Ian Hamilton Finlay, born in 1925 in the Bahamas and now living in Stonypath, Scotland, will be showing his work at the Joan Miro' Foundation, where he will also be creating a special installation in situ. The exhibition is supported by the British Council. Finlay first made his name as an avant-garde poet, particularly as a writer of concrete verse, in the sixties. His most important contribution was the "one-word poem" consisting of a title and one word. Later on he discovered the artistic forms of classical antiquity and used them in his work as a landscape designer. In this field perhaps his best known work is his own house at Stonypath in Scotland, called Little Sparta. These two activities are inseparable. Considered as a whole, his work challenges the conventional opposition between avant-garde and tradition, and between poetry and the visual arts. Finlay likes to call himself a poet, in the tradition of the artist-poets and poet-artists from the Renaissance to the avant-garde. Indeed, much of his output is on the borderline between poetry and some other medium. Finlay's work is not easy to classify since it embraces many fields and involves the collaboration of many people, from traditional craftsmen to architects, including other contemporary artists, since he does not actually make anything himself. His art is inspired by the French Revolution of 1789, with its theoreticians, philosophers, commentators and poets, as well as by the poets and dramatists of classical antiquity, without forgetting Neoclassicism and the artistic avant-gardes of the twentieth century. Through his art, Finlay tries to make an impact on the public in a certain political sense. He does this by installing his works in situ, adapting them to the context of parks, gardens, architecture and nature. His sculptural artifacts espouse the traditional concept of art as a depository and transmitter of meaning. His starting point is always poetry, and his public works also derive their significance from the spoken and written word. Coinciding with Barcelona's "1999 Spring Design Show", the Joan Miro Foundation will be presenting Droog Design, which will share the exhibition space with the show of work by Andre' Ricard. The two exhibitions will enable us to compare the work of one of the pioneers in the field of industrial design with that of the latest generation of designers in the Netherlands, grouped under the name of Droog Design. Design today is appreciated fundamentally for its economy of forms, simplicity and sensitivity to the needs of the end-user. Objects have to be durable, re-usable and above all practical. Items that fulfil these specifications can be found everywhere, but a group of Dutch designers have responded to these requirements with a unanimity that deserves special attention. It was the well-known jewellery designer and teacher Gijs Bakker and the design critic Renny Ramakers who started this cultural phenomenon. It all began in April 1993 with a group exhibition at the Milan Furniture Fair by a number of designers who all shared the same idea: a minimalist approach to design. In 1994, they set up the Droog Design Foundation, which is more of a federation of individual styles than an aesthetically cohesive group. The name Droog, which means dry, can be interpreted as a pun, in line with the irony that characterises the Foundation's design work. It is a dry design, originating in a country that has had to reclaim its land from the water. Droog Design does not represent a particular style but rather a mentality. The only constant factor is that the creative concept must be valid and must follow clearly defined, convincing lines. During its initial phase, the materials used were cheap and easily obtainable - wrapping paper, re-used fabrics and articles, which gave the pieces a "poor" look. Later, they added synthetic materials produced in collaboration with the University of Delft and its studies in aerospace technology. Some pieces are so complicated and experimental that they are likely to remain as permanent prototypes or one-offs; others are mass-produced. The items that will be shown at the Joan Miro' Foundation come from the Centraal Museum in Utrecht, which purchased the collection from the Droog Design Foundation in 1997 to avoid it being dispersed. Coinciding with Barcelona's "1999 Spring Design Show", the Joan Miro Foundation will be presenting an exhibition of work by Andre' Ricard, a pioneer in the theory and practice of industrial design in Catalonia. Born in Barcelona in 1929, Ricard has worked as an industrial designer since 1958 and has also had a special interest in design theory, a subject which he has taught and on which he has written a number of books. As a consequence of his interest, too, in raising the profile of the profession, he was a founder member of ADIFAD, of which he was president from 1972-74, vice-president of the International Council of Societies of Industrial Design (ICSID) for ten years, and founder and president of the Associacio de Dissenyadors Profesionals (ADP). This exhibition, selected by Oriol Pibernat, is aimed at explaining to the public what design is all about and how it intervenes in so many aspects of our daily life. Through this display of work produced by Andre' Ricard during his professional life, accompanied by his own explanations, we will be able to see why objects are designed as they are and not in any other way. Also on show will be some of Ricard's more lighthearted designs, such as the ones he did for the 1992 Olympic Games and Barcelona's candidature for the event, as well as the Olympic movement in general, along with all the perfume bottles he has designed. Two videos will be shown as part of the exhibition, one on the designer's institutional activities and his work as a teacher and design critic, and the other illustrating his professional career.